January 18, 2016 By Liz 70 Comments Note: This post may contain affiliate links. 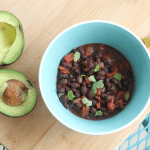 This blog is all about easy ways to live a little healthier, which is why I’m so excited to share this kitchen hack with you! I’ve had a rice cooker for a few years (it was a gift from my sister in law!) and I love it. But I’m kicking myself for not trying this sooner. Sure, it cooks rice perfectly, but did you know it’ll cook quinoa perfectly, too? It makes sense but for some reason, I’d just never given it a shot. And if we’re being honest, quinoa was always one of those foods that seemed tough to get exactly right. Mine wouldn’t be quite as fluffy as I hoped, or there would be a few spoonfuls stuck to the bottom of the pot. Nothing awful, but it just wasn’t quite right. Then I dumped my quinoa into this magical contraption and the result was perfectly fluffy quinoa! Magic! 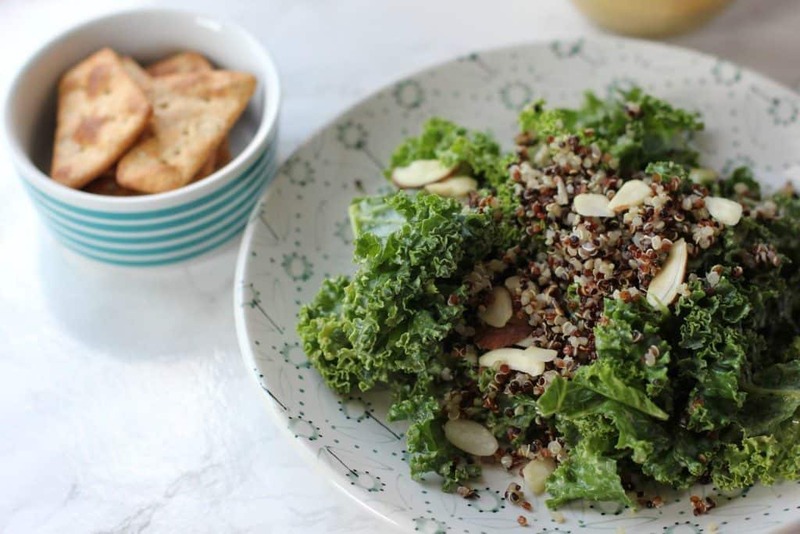 Quinoa is a complete protein, meaning it contains all the essential amino acids your body needs! 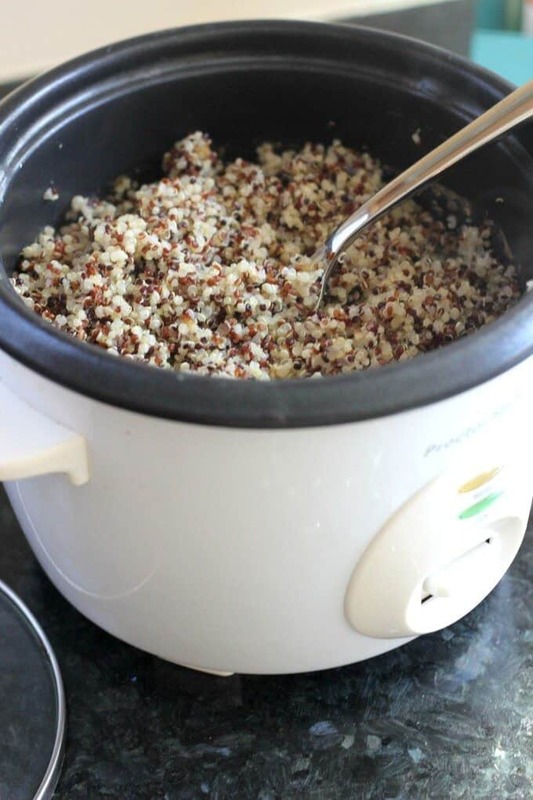 Making quinoa in your rice cooker is a fast and easy way to get perfectly cooked quinoa! Pour the quinoa and broth or water into the rice cooker. If you’re not sure what you’re going to use it for, you might want to just use water. If you know your future plan, broth can be a good option to give it more flavor. Add in salt and turn on the rice cooker. Most will be done cooking in around 30 minutes. Once it’s done cooking, wait a few minutes and then fluff it with a fork. It will end up making about 3-4 cups of quinoa. Don’t remove the lid while the quinoa is cooking. Once it’s done, fluff it with a fork before serving. 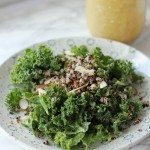 I was so excited about this, I already made this kale and quinoa salad with my first batch of quinoa! The recipe was already easy, but now I can whip this together in minutes before popping it in the oven! If you’re looking for a rice cooker, this one makes a perfect batch of quinoa. This is the rice cooker that I have (affiliate link) and it works great! I’m sure it would work in pretty much any sort of rice cooker though so if you already have one at home, give it a try! What’s your favorite kitchen appliance? 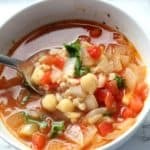 I love love your “simple” recipe posts more than anything. I hate crazy complicated recipes, so gravitating towards the every day, doable ones are my thing. Thanks for sharing – never thought of this! That makes me so happy to hear! Sometimes I feel silly for posting “simple” ideas but at the same time, I feel like those are the most practical! I never thought this was possible, thanks for the hack! No problem! Anything that makes healthy meals easier is worth sharing! wow… thank you so much for this healthy, easy to make recipes!!! Specially this “Qinoa cooked in Rice Cooker”. …you are awesome! I have a rice cooker that we got and have yet to use. I think next time we cook quinoa I’m going to try it this way. I so easily forget about my slow cooker and how it can do absolutely ANYTHING. I’ve never used it for quinoa, but definitely hear you on not always getting the best results when done on the stove. Will definitely keep this in mind for next time. I would assume that a slow cooker would work similar to a rice cooker although I’m not sure. Worth a shot! A sow cooker wouldn’t work the same. Love my rice cooker, it makes the absolute best pork tenderloin. Make diagonal slices in roast, slice up an apple and a sweet onion. Put a slice each Apple and onion in the roast slots. Add 1 tbsp brown sugar, a tsp each ginger, cinnamon, and allspice. A cup of chicken broth. Set cooker to meat and wait for it to be done. Meat falls apart. Cook quinoa or rice as a side dish. It makes the absolute most wonderful meal. Even my son, who finds pork too dry, loves this dish. He told me it’s the best meat he has eaten. Your rice cooker has a MEAT option?? 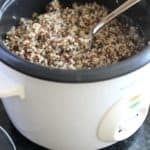 I love using the rice cooker for quinoa, it makes it so easy instead of standing and stirring! Ooh what a great idea! I don’t have a rice cooker, but I do love the idea of making a bunch of quinoa on the weekends. I love finding new ways to use an existing appliance haha. There will be lots of quinoa batches in my future! You’re not overacting at all! This is mind blowing stuff, lol! I agree, quinoa can be difficult to cook perfectly so knowing that the slow cooker does such a good job is valuable information. Thanks for sharing! My sister lovessss her rice cooker! I feel like I have too many kitchen appliances already so I will probably never get one, but my step mom is going to get one soon so I will definietly be borrowing hers! And I agree that quinoa can be quite fussy sometimes, so this simple way to cook it sounds perfect! I love that you can make a huge batch for smaller recipes! I love it for rice and now I’m excited that it’s not a single-use appliance anymore!! Yes I love life hacks like this. Set it and forget it. Our rice cooker only works about half the time, but when it does it’s glorious!! Great post. Wish I though of it first. Ha ha! The quinoa looks fluffy and delicious! Here’s my question. My rice cooker has a couple settings. I am guessing I would use the white rice setting, not brown rice (a longer cooking cycle). My white rice setting cooks for about 40 min. to complete the cycle. I do not have a timed option. Do you think I should simply open the cooker after 30 minutes? Thanks. Hey, Peggy! Mine only has one setting, which I think is for white rice. I would try using that one. As it’s cooking, the water will start to disappear. I’d check it around 30 minutes and see if there is still some water that needs to evaporate, or if the water is gone. If the water is gone, I’d turn it off, cover it and leave it for another 5 minutes or so, then fluff with a fork. Hope that helps! Thank you! That was my question as well. My family has never had quinoa. We love rice though. I think I will try it. Since I can make it in my rice cooker, at least I will know how to cook it now. Thank you. I hope you like it! It’s so versatile! My daughter uses her rice cooker all the time so I’ll pass this recipe on to her! I might even ask for one for my birthday! 🙂 Pinning too! I am really glad to have this recipe, so I can make the Quinoa in my Rice maker. Thanks so much for sharing with Full Plate Thursday this week. Hope you are having a great day and come back to see us real soon! I just started cooking quinoa and had the same problems you listed. I love it more than rice. I have a rice cooker that is just waiting for a batch of Quinoa! I am new to using a rice cooker and I purchased a rice cooker that allows you to push a button for white rice or brown rice. When making quinoa what setting do you use? Also, do you use the rice measuring cup that comes with a rice cooker or an actual 1 cup measuring cup that is used for baking? I really would like to make this recipe. Thank you for your help. Hi Colleen! Mine doesn’t haven’t multiple settings so I would just try the white rice setting. I use an actual 1 cup measuring cup when making this. Hope it helps! Good luck! Hi Liz! Thanks for linking up to Thriving on Thursdays last week. I love this idea. I love using quinoa especially now that’s it’s summer here in Australia and using them in salads. I’m definitely giving this a go. Anything to make my life easier. Letting you know I’m featuring this post at tomorrow’s party. Thank you. Rice cookers are a blessing in disguise for many recipes, easy prep and clean up. 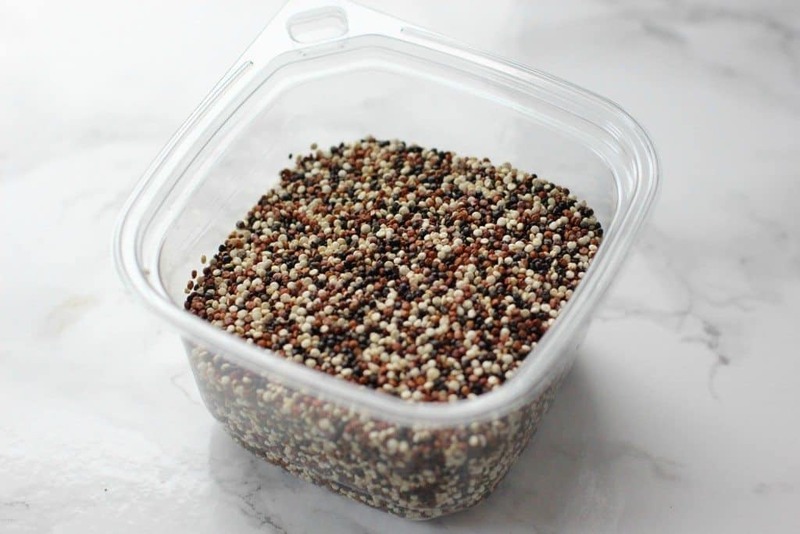 If you sometimes find quinoa a bit bitter, you can swap one cup of water for one cup of coconut milk, it will make the quinoa a bit milder. It’s versatile enough that you can use it for both sweet and savory applications. Oh that’s interesting! I’ve never tried that! This is great,I’ve been trying to eat healthy and fell in love with quinoa,but as you said it’s not easy to get it cooked the same as delis and resturants,I gave up and bought a rice cooker with the intent for settling on brown rice recipes,it cooks my rice perfect everytime.I’m running out to whole foods now excited that I can get 4 varieties or more of organic quinoa. Thanks for sharing this for me it’s a game changer and a life changer. Makes sense but never thought to try this! I discovered this method a little while ago too. Did you know you can also cook mac and cheese in the rice cooker?!? Wonderful idea! Never thought of cooking cereals in my rice cooker, thanks! I love this post, quinoa can end up really mushy if it’s over cooked so thank you for the great idea. I love quinoa. I’m always looking for better tips on how to make it just right. Thanks for this helpful post! Oh my gosh, this is a genius idea! I am going to try this, soon! I cook quinoa every single week. THANK YOU! What a great idea! I would have never thought of this. And, yes, sometimes the simplest how-to’s are the best! Excellent tip! I really need to get a rice cooker. What could be easier but it’s great to pint this out so people are aware of this awesome method. I just put some Quinoa in my Rice Cooker and I put it on “White Rice” setting. I’ve made it that way before and it comes out fine. Thought I’d include this for others who have the settings for different types of rice on their Rice Maker. Thanks so much! That’s so helpful! Works great in the rice cooker! I’ve usually prepared it in the pressure cooker but that’s more hands on. If you’re interested though, in the pc you bring it to boil, secure the lid and just approach the second red line (Kuhn Rikon pc). When you hit the (2nd) line, remove from the heat and let the pressure come down naturally. It’s the fluffiest quinoa I’ve ever seen. 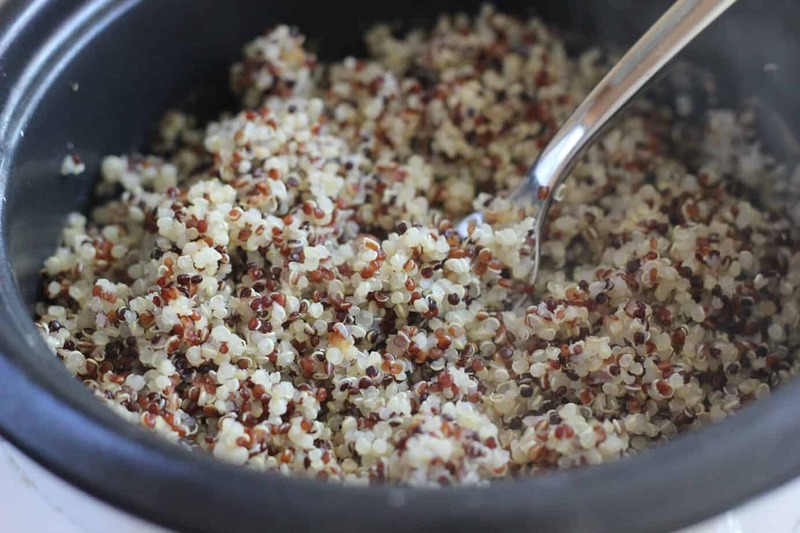 This is such a simple and great way to cook quinoa. Love having hands-off ways of making quinoa – such a great idea in the rice cooker! Great idea…I have a rice cooker that barely gets used. I can’t wait to try this out. 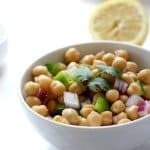 This recipe is great and it has saved me numerous times when it comes to dinner prep, thank you! Liz, hi! This recipe looks amazing! I’m so excited to try it.What would be something good to serve with this? Liz, bravo! What a great idea! Love this. I’m sure this is incredibly delicious! Liz, thanks! I’m going to have to try your recipe. It looks delicious! Thanks for the simple recipe! Liz, WOW! so simple, yet SO tasty! This is fantastic, yum. Thanks for the recipe. Liz, thank you for sharing this! I have made this so many times. Everyone that tries it, loves it! What kind of passive agrressive posts MEAT recipes on a vegetarian site?